Finding that Joan’s position was that she was a bit homesick and wanted to visit the family, so I sent her back to South Africa for a three months holiday and to spread the good news of freedom land. She was back within three weeks though, for conditions had gotten worst and she couldn’t handle it because of the comparisons of the two countries attitude to freedom. The information and stories that Joan brought back with her from her trip to South Africa was deplorable and pitiful because of conditions having further deteriorated to an all-time low. Non-white workers in Durban who went on strike for some resemblance of better conditions where put on notice according to White workers that they were causing a resurgence of illegal labour organizations. While she was in Johannesburg visiting her brother en route, an uprising by Africans in Soweto because of constant police harassment resulted in riots and deaths of Africans. In Cape Town she found that civil disobedience had escalated and that school students of all non-white communities were forming organizations to voice their protest. Silent protests and marches were met by armed police and army gun-trucks where they were either teargassed or run off the road. The feeling of fear, anger and aggression that was emitted all around her became so stifling and unbearable that she phoned me from Cape Town to come home to the freedom of Australia. I also found of my time spent on Australia’s soil that its landscape looked like it had just been born, whereas other world continents that I had been too had modern landscapes of magnificent mountains, snow covered peaks, breathtaking waterfalls, continuous fast flowing rivers, ocean looking lakes and exceptional fauna and flora. Australia on the other hand looked like a youthful continent of ancient times with its flatness, stunted mountainous outcrops and arid land that not only spoke of a ‘sunburnt country’ but also for it having to be treated and cared for with respect by its occupants so as not to be abused as the other continents had been. That didn’t take away that it had a coastline of world renown beaches like Bell’s Beach in the state of Victoria, Bondi in New South Wales and Surfers Paradise in Queensland that was as spectacular and varied as its centre. Jagged rock formations on its plains, with Uluru (island mountain) or Ayers Rock in the Northern Territory, which is the world’s largest monolith, looming in the middle of the ‘Outback’ plains, and the Kakadu (Aboriginal=Cockatoo) in the ‘Top End’ with its tropical swamps, giant saltwater crocodiles and Aboriginal carvings and cave paintings. Still in the north, carol reefs with the Great Barrier Reef as the world’s largest living organism that sprawled along the state of Queensland’s coast and had the world’s oldest rainforests thrown in for good measure. New South Wales was a state of baffling geographical contrasts because of the varied climatic conditions that would occur on the same day, for it could be snowing on the Southern Alps while spiraling dust storms may be sweeping the west and monsoons could be flooding the east. But on the rest of the good days, hilly plains as far as the eye could see, sea lakes and harbour towns. Its next-door neighbour Victoria was the most mountainous state with alpine mountains; desert plains, lakes and the most unpredictable weather that could see it receive rain, hail, snow and sunshine all on the same day. The distinctive lavish wilderness of Tasmania as an island state off its coast, which had the Bass Strait separated them, included rugged mountains, highland lakes and forests, and made it a unique ecosystem due to its protection. South Australia that bordered Victoria was blessed with a Mediterranean climate that gave it endless ribbons of beaches, and with the backdrop of its leafy hills, mountain ranges and several thousand kilometres of nothingness plains made it a beauty spot on the face of Australia. It in turn had as its neighbour Western Australia with its breathtaking Kimberley region of blood red desert sliced by lush forest filled watered gorges and enormous Aboriginal tribal lands, and virtually kilometres of uninhabited coastline. I to my pleasure when traveling the length and breadth of Australia discovered almost all of that and more, just as doing when traveling around the world. 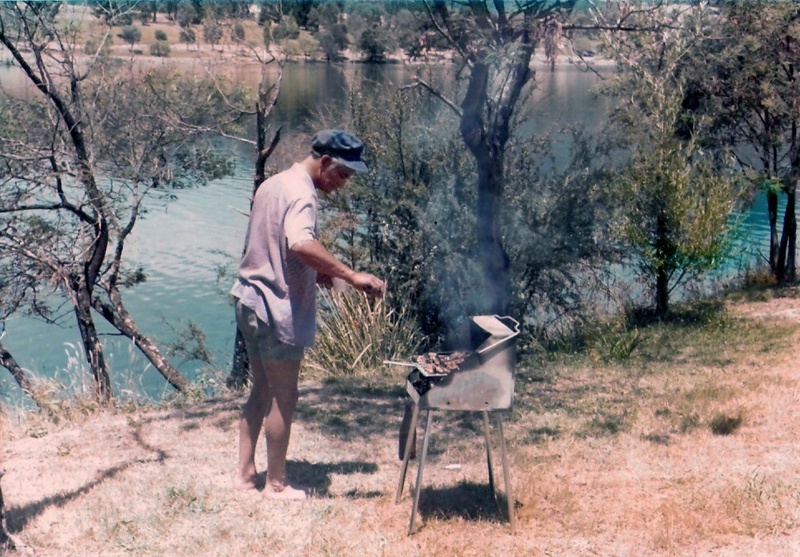 Although the wife and my journey to freedom had only been partly decimated by the Afrikaner National Party, and we had felt the brunt of it; however, the freedom reached and obtained in another way in Australia compensated for that, for it gave us the right and independence to allow us jaunts to and fro from our home in Melbourne to explore and discover a country that we had fallen in love with. Our other expeditions saw us experience most of what the travel and tourist brochures offered in Canberra and in the Australian Capital Territory, Sydney and in New South Wales, and Adelaide and in South Australia to where we traveled via Ballarat to Bordertown. The road from there consisted of a boring drive that wound through flat farmland until reaching the Grampians with its chain of granite outcrops with Aboriginal art sites in caves and rock shelters, and then wheat fields again until we reached and crossed the Murray Bridge and Murray River into Adelaide. The city facing Saint Vincent’s Gulf off the Southern Ocean although of small townish atmosphere consisted of well composed neat tree lined terraces, expansive park-lands, superb stone churches, and architectural and cultural attractions with the Torrens River meandering through the city and navigated by launches and rowboats. We were able to savour the city slowly because of its setting out compactness that had most of everything to see within easy walking distance. Having heard people call it ‘the city of churches’ was easy to see why; for there were plenty of them including magnificent cathedrals in a small radius, but that took nothing away from rather unique features there. Rundle Mall was colourful with fruit and flower stalls, and because it was a hive of activity it reminded me of the same atmosphere of the stalls in Cape Town City. What was different though was the ‘pie floaters’, a chunky meat pie doused in tomato sauce and floating in thick pea soup that were sold from pie carts at night for hungry people as ourselves until the wee hours of the morning, and again I came across another South African War Memorial dedicated to the Aussies that gave their lives in the Anglo-Boer War. For cricket fans like myself, the Adelaide Oval that had an attractively open ground with a marvelous crowd atmosphere, and to my amazement though it still had operational the oldest scoreboard (1911) used for test matches. Maslin’s Beach South we found was a nudist one and we tested the waters, and the day and twilight boat cruises on Gulf Saint Vincent was tried too. Drove towards the coast to the peninsulas of Fleurieu, Yorke and Eyre that abounded in scenic drives with bays, beaches, ports and parks. Apart from that, there olden time cottages, historic buildings, disused mines and ones in operation, the influence of the Cornish, Welsh and German miners, and an abundance of wineries was worth the exploration. As in Melbourne, Adelaide too had its ethnic communities, but they were spread out in the surrounding hills with huge eucalyptus and introduced deciduous tree that created a magnificent feature to the landscape. German Lutheran settlers escaping religious persecution in the early 1800 settled and established Hahndorf that had many old German style architecture buildings, a beer hall and of course cuckoo clocks; however, during War World 2 the town was placed under martial law because of their German nationality. Scottish immigrants at about the same time established Strathalbyn, and it had wonderful old streets-capes and impressive Celtic heritage displays. Cornish copper miners established the town of Callington in the mid 1800’s, and although decaying it still had plenty of character. The English settled in Sterling in which there were glorious old English gardens, extensive plantations of exotic deciduous trees and historic walks established in the mid 1800’s. And then there were the wide-open spaces of South Australia’s Outback that stretched to the borders of Western Australia, Northern Territory, Queensland and New South Wales. The Nullarbor (Latin=No trees) Plains, which we didn’t venture into, was part of that, and the derived name from Latin for ‘no trees’ spelled it out for the awesome space, silence and solitude. On the other hand, to compensate for that there was the oil and gas field, copper and uranium mine, and opal mining in which Coober Pedy’s (Aboriginal = white fellow’s hole in the ground) high daytime temperatures and freezing night-time ones forced the residents to not only live in underground homes where their occupation had taken them, but also to extend that to underground shops, restaurants, motels and churches, and was the world’s largest opal field for white ones. Thrown in for good measure the Simpson Desert with the Birdsville Track running in between it and the Stuart Stony Desert, which was advisable to travel the route by a Four wheel drive vehicle or camel, and the Woomera (Aboriginal = spear throwing tool) Prohibited Area that was run by the American space agency NASA as a communication, tracking and defense system. Also, Lake Eyre that was almost smack bang in the centre of the three deserts of Simpson, Stuart and the Great Victoria with ‘The Ghan’, which was so named after the Afghan camel drivers who pioneered transport in those parts, that was the railway that ran between Adelaide and Alice Springs in the Northern Territory, and the Aboriginal Pitjantjatjara people. Australia’s wine industry first began when the First Fleet of eleven small ships under Captain (later Governor) Arthur Phillip with 1 000 passengers, three-quarter of them convicts, arrived at Botany Bay in 1788 to start an English colony. And in the cargo carried was grape vines picked up en route from their other English colony in the south of Africa, which was from Cape Town in the Cape Colony. That South African and Australian connection not only saw the vineyards spread from Sydney to all other States and Territories for the grapes grown and the wine made, but also farm animals for consumption and breeding, flour for bread and wheat-seed for sowing, and vegetables and fruit. South African perennials, deciduous and fruit trees followed so as to introduce more greenery and shelter because of the overwhelming eucalyptus trees, which grew everywhere, and the coastal banksia that were sparse in foliage. When wandering around the country and recognizing also the shrubs and plants that were introduced, I have thoughts of being back in South Africa with the memories it invokes. That though takes nothing away from Australia’s unique flora that not only stirs the senses but is not also found in other areas of the world. The gold and green of the wattle (acacia) from which we Australians draw our national colour and our floral emblem, the kangaroo paw because of its resemblance to the hind paw of the kangaroo, the Sturt desert pea of the semi desert variety that proliferates at the slightest hint of moisture, the heath, mallee and daisies that burst into bloom in the wet season and the grasstree called ‘black boys’ because of the spear like black vegetation the juts from its centre are some of the well-known native ones. Maybe I would have felt right at home too if Australia had introduced African wild life instead of the feral English rabbits, fox and cats to make them feel at home. Maybe it’s not too late to do that in the introduction of a few hyena to rid the country of dead carcasses of kangaroo and for them to keep it clean as garbage disposal units as done in Africa, which would also aid in the plague of flies, and they love hunting small animals like cats, and the introduction also of cheetahs, which can be kept as domestic pets that would soon wipe out the rabbits and fox. But then we also have to consider our wild fauna that because of its isolation from the rest of the world took on a unique character. Where else but ‘Down Under’ would you find mammals that lay eggs, spiders that eat birds and rats that eat pythons. The amphibious duck-billed platypus would receive no problem from the hyenas and cheetahs because they wouldn’t know if it was poultry or a fish, the shy cuddly tree dwelling koala who at most times is in a coma because of living off a diet of eucalyptus leaves wouldn’t get a look in due to the two of them not liking a stoned diet and the exertion of climbing trees, and the wombat with its big fat backside would seem to them as an African kopje and be used only to lay in its shade. They would be intrigued though by the swans that they knew as being white in South Africa but are black instead here, but wouldn’t harm them thinking they were Africans, and the hyenas would think that they had found a long lost relative when hearing the kookaburras peal of manic laughter as theirs sound also. Of course both of them wouldn’t have a bar of the emu as they do to the ostrich in South Africa because of its defensive destructive talons and speed, and the echidna (spiny anteater) that has the same defense as a South African quilled porcupine. 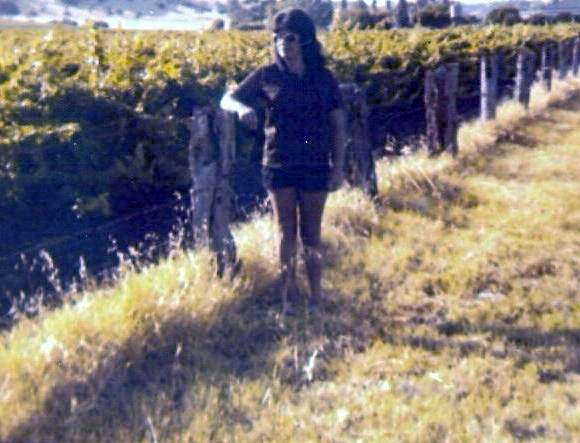 The Barossa Valley of world famed Australian wines with its neat regimental precise staked fields of vines in fifty or so wineries, which we found was a wine connoisseur or tipplers paradise, had become part of the grape vine legacy. The Lutherans influence was not only in the vines but could also be seen in the beautiful stone constructed churches, cottages and town buildings. The Barossa Vintage Festival was a thanksgiving celebration for the region’s grape harvest, and it included lavishing tastings, grape picking and treading contest, and a vintage fair. The German heritage in the valley stood out in the wine brand names, Lutheran spired churches, quaint blue-stone villages, their own style cottages and farmhouses, cooking restaurants and what was displayed in their delicatessen shop windows, and they also spoke Barossa German language. We stayed at the Reservoir Motel in Reservoir as a base, and because Adelaide’s drinking water was so brackish and discolored because of the red earth, Joan and I were consuming Adelaide’s wine instead, but their other water that we enjoyed though was at the nudist beach where we frolicked and splashed to our hearts content. Another bit of sightseeing and information that was of interest to me was in the gleaning and seeing of Saint Mary’s Convent where Sister Mary MacKillop was excommunicated due to making a stand against South Australia’s Catholic religious hierarchy. It seemed that it was all due to a Jesuit priest and herself establishing the first ‘free’ school in Australia where fees were only for those who could afford it because of them jointly agreeing that all children should have an equal education regardless of parent’s social or financial position. What accelerated it further was on her starting up the Order of the Sisters of Saint Joseph of the Sacred Heart whose primary purpose was to educate and care for the poor, and within a year she had thirty sisters running eight Josephite schools, an orphanage and a home for ‘fallen’ women. That didn’t go down to well with the high archdiocese because of her still standing adamantly by her philosophy that every person should be respected and valued as an individual regardless of colour, creed or social status, which Australia hadn’t yet come to terms with in the mid 1800’s, and of course she would have fought a losing battle in South Africa. Fortunately, the Vatican saw it the other way after a Commission of Inquiry had cleared her of any wrongdoing, and whereby she was reinstated and received approval of the Joephites. Although her order went from strength to strength and established 112 schools and eleven charitable homes, her ailing health didn’t, until due to overwork and stress she died in 1909. The goodness of her unselfish sacrifice I found was being rewarded most appropriately by what many saw as miracles to what she had achieved under dire circumstances and situations, and has now been declared Australia’s first saint by Rome. The Murray River with its beginnings in the Snowy Mountains that coursed along the border of New South Wales and Victoria to end up in South Australia and flow into the Southern Ocean, had throughout the entire Murray area good fishing, swimming, water-skiing, all boating which included day cruising, house boating and paddle steamers, and it went all the way to the Murray Bridge. From there we returned via the coastal southeast return route of saltwater lagoons, sand dunes, salt-pans, fishing villages of lobster, weathered limestone caves, lakes and Mount Gambier. From there we stopped twice after branching off onto the Great Ocean Road to Port Campbell to view the battered limestone cliffs that the breakers had created into arches and sea sculptures. And then at the world famous Bells Beach of surfing classic fame that had natural rock sculptures carved by fierce ocean waves and sheer rugged cliffs, and all the way to Melbourne from there we had oceanic mountain drive views. 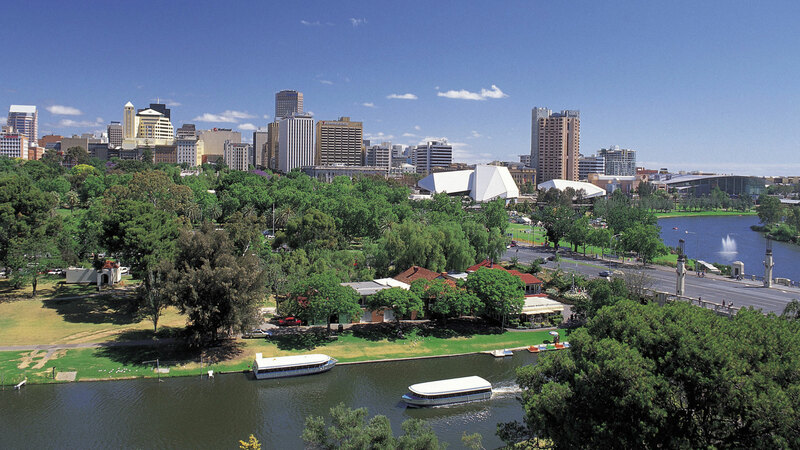 Adelaide in South Australia on the Torrens River as is all Australian Capital Cities situated on rivers. Taking a break from the driving to have a good old South African braai (barbeque). 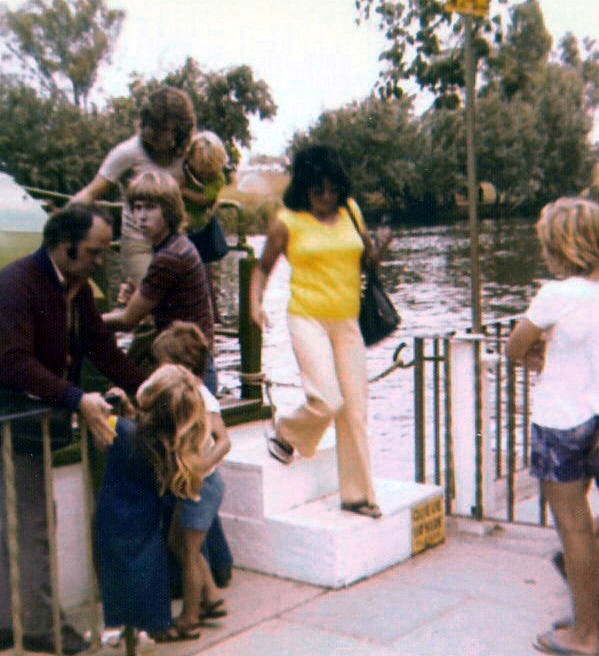 Joan stepping off rather gingerly from the boat cruise on the Torrens River. Barossa Valley vineyards where Joan and I tippled so many varieties of German wine that it took me the whole of the following day to sober up to drive back to Melbourne.